The plant produces green/red shoots in early spring which can reach a height of 3 metres before dying back in autumn. Its stems can range between 2-3m in height; stems are green with red or purple specks and form dense cane-like clumps. The plant's shoots and leaves, which can be up to 120mm long, can cause very dense coverage of colonised areas. The plant spreads underground by means of rhizomes (a root-like underground stem). Rhizome fragments can produce new plants. However, Japanese Knotweed cannot spread by seed. Can I use weedkiller on it? Yes, weed killer (herbicides) if used properly can be effective on Japanese knotweed. There are number of proprietary 'Off the Shelf' products that can be purchased from garden centres and DIY stores that can be used to control the growth of this plant. If you are unsure seek advice at your point of purchase as to the most appropriate product. It should be noted that one spray will not be sufficient to kill this resilient plant and its root system. It can take between 8-12 sprays spread over 2-3 years during the active growing season (spring/ summer) to have any impact on a well established colony of Japanese Knotweed. Unfortunately even with this frequency of spraying there is no guarantee that the Japanese knotweed will be fully controlled. However, if the manufacturer's recommendations for the safe and appropriate use of the weed killer are followed during the growing season then the plant should be kept in check and should begin to die. Can I cut it down? It is not recommended to cut it down as this can lead to further spread. As stated the plant is best treated by applying appropriate weed killer (herbicide). Will burning it down kill it? Burning knotweed down will not kill it, it will only destroy the above growing stem part of the plant having no effect on the roots. Regrowth will appear shortly after any burning operation. Burning can release nutrients into the soil and this may encourage more vigorous regrowth of the plant. Can I pull/dig it out? The digging out of Japanese knotweed is not recommend; the roots/rhizome and associated soil are classified as 'controlled waste' therefore, it cannot be removed from the site, except under controlled measures to a licensed disposal facility. It is recommended that where removal is necessary it is undertaken by a licensed contractor under rigorous control measures to an identified and as stated licensed waste facility. It should be noted that due the ability of the rhizomes/roots to spread and fragment then the quantity of soil to be removed from site may be considerable. The uncontrolled and random digging out over the years along with improper disposal or dumping is now recognised as one of the major causes of Japanese knotweed spread. Can I compost it or place in my Brown Garden Recycling bin for the council to collect? No living parts of a Japanese knotweed should be placed in either a domestic garden compost bin or garden waste bin (Brown Bin) that is collected by the local authority. It should also not be placed any other bins that are collected or in skips. What can I do if it is growing on someone else's land near my property? If the land or property is not owned or maintained by us please visit the The Registers of Scotland website to establish the ownership. What can I do if it is growing on someone else's land near my property and they do not wish to control it? Please visit the Non Native Species website for advice. What if it is growing on Council land near my property? If you find Japanese knotweed growing on land owned or maintained by us, which is in close proximity, of your own property please contact us. What if it is Japanese knotweed growing in a Glasgow Housing Association near my property? 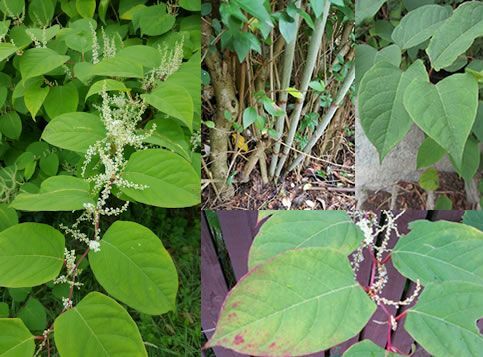 If you find Japanese Knotweed growing on land owned or maintained by your Housing Association or by a known private landlord which is in close proximity to your own property, please contact them directly to raise your concern and for their action. Can Glasgow City Council control it in my garden? No, we only carryout maintenance operations on land owned or maintained by ourselves, we cannot undertake private operations such as this. I have seen Japanese knotweed growing on a riverbank/park/open space what should I do? We are aware that there are several sites throughout the city where Japanese Knotweed is growing and is well established, much of this is land not maintained or owned by the Council. However, where the property is owned or maintained by Glasgow City Council and where it is safe to do so we will endeavour to minimise through control the potential for Japanese Knotweed to spread into the 'wild' or onto adjacent private property when awareness is raised. Who will control it on my land? If you are unable undertake the actions to control and treat Japanese Knotweed found on your property directly by yourself then there are companies that will either offer this service within the scope of their business or specialise in 'Weed Control'. We cannot recommend any company or organisation to assist in the control of Japanese Knotweed; however, we would advise you to seek more than one quotation and ensure the company are adequately insured and licensed to carry out the works required.